I can’t say enough about my friend Catherine… whom I adore. Not only is she the kindest person with the sweetest smile, she is not afraid to give anything a try in the kitchen. We had a girls night in to catch up, drink wine and cook some things on our “blog list”. She brought Mark Bittman’s Bok Choy recipe and I did my mom’s Beef Stroganoff (recipe coming soon). As an appetizer we devoured brussel sprouts glazed in maple syrup with bacon and for dessert we munched on squares of dark chocolate. Life is good. Soak shiitakes in one cup of very hot water until tender, about 15 minutes. Drain, reserving liquid. Trim mushrooms and chop. Separate leaves and stems of bok choy; cut stems into 2-inch lengths and slice leaves into ribbons. Heat 2 tablespoons oil in a wok or large skillet over high heat. When oil is hot, add bok choy stems, garlic if you are using it, reconstituted mushrooms, and about 1/4 cup reserved mushroom water. Cook, stirring frequently, until stems are crisp-tender, about 4 minutes. Meanwhile, in a small skillet heat remaining 2 tablespoons oil; sauté fresh shiitake mushrooms over medium-high heat. Continue cooking until they begin to brown and crisp on edges. 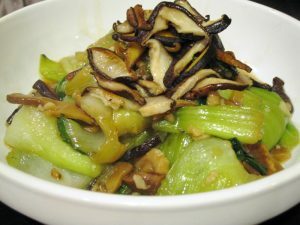 Into the large skillet or wok, add bok choy leaves and oyster sauce and toss vegetables gently to combine; continue cooking until greens wilt, about 2 more minutes. Serve immediately, topped with crisp mushrooms. Wow. Yvonne. You made my day. The admiration is mutual. I loved our cooking night!